NB: Old Brockers/Sandboxers may well remember the above two submissions. Please do not reveal this person’s name in any comments. A previous post prompted a request to avoid this due to its upsetting effect on family members who are ill and the name has been taken off these files. Thanks. 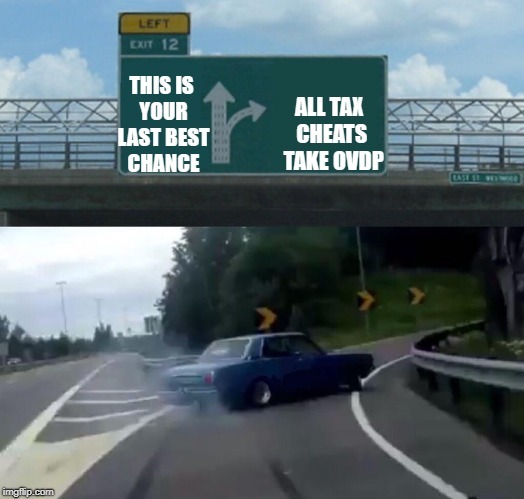 - victimized by the convergence of unclear IRS objectives, bad advice from “tax professionals” and (most significantly) their own desire to be in compliance with the laws. It isn’t even just that the U.S. imposes taxes, it is the extension of the entire tax code that is problematic. Eritrea may charge a few percent, but they don’t force Eritreans living elsewhere to only buy Eritrean mutual funds. How many people don’t owe money to the U.S. but losing 1%-2% of their income on preparation costs or lost opportunities? There is so much dead loss. The US could withhold from a Canadian source in 2002, I think they can withhold from a Canadian source in 2018, and I’m pretty sure I read that they could withhold from a Canadian source in 1924. I’m pretty sure it was in the 1920′s that the US coerced Canadian intermediaries to verify residences of holders of Canadian accounts, so if an account holder moved from Canada to the UK then the Canadian intermediary would start withholding the full amount of US withholding required by US law instead of the reduced amount set by the Canada – US tax treaty. Of course my situation was somewhat the opposite. When I was a US citizen, Cook v. Tait (and Form 1040 instructions and IRS Tax Tip 307) say I could get refunds of US withholding. The IRS did pay refunds as long as the withholding was reported on anything other than Form 1099, the form that Monica Hernandez embezzled from. Anyway, Cook v. Tait exists because Cook fell for Tait’s trick, but if Cook didn’t fall for it the US could have confiscated someone else’s withholding in order to get … oh wait, if it were someone else v. Tait then the US wouldn’t want to let the person get their refund. Hmm. Sometimes a person loses more than 100% of their income when they didn’t even owe any US tax. I’m sorry, I don’t see the connection. Cook didn’t have US tax withheld. He was asked (or “demanded”) to file a tax return, and did so under protest. He was assessed for tax on the sale, and paid the first instalment in order to be able to exercise his right to appeal. He lost. End of story. It’s all there in the SCOTUS judgment. Plaxy, let’s figure out what you’re asking. “Cook didn’t have withholding.“ — Was my statement relevant to Cook v. Tait? ‘Correct: the US couldn’t withhold US tax from non-US-source in 1924 any more than it can in 2018.’ — Was your reply to my statement relevant to Cook v. Tait? “Most of my US withholdings are from US sources. Only one was from a Canadian source. I filed for refunds because the withholdings were overpayments.” — Was my reply to your reply relevant to Cook v. Tait? I disagree with your statement that the US couldn’t withhold from non-US-source income in 1924. I think we agree that if Cook hadn’t fallen for some Bull then there wouldn’t have been a Cook v. Tait. But I think there could have been a someone-else-v-Tait from someone else trying to get their withholding refunded. If Cook hadn’t filed a US tax return there wouldn’t have been a Cook v. Tait. Though we don’t know much about his circumstances – if he was planning to move back to the US, or may have had US assets. For whatever reason, Cook voluntarily filed his return, and pursued his fruitless quest for justice all the way to the US Supreme Court – resulting in the unenforceable doctrine of CBT and the consequent invention, decades later, of OVDP and the rest of the oppressive and malignant campaign.